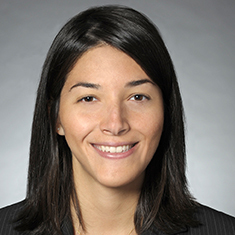 Elizabeth Dominguez Yaeger is an associate in the Real Estate practice. Elizabeth counsels her clients on a wide range of real estate matters, including the acquisition, disposition, debt and equity financing, development, and leasing of commercial properties and multifamily housing. She routinely represents financial institutions, developers, owners and investors in all aspects of real estate transactions and is unique in her ability to problem-solve and move all parties toward the common goal of having an efficient closing. Elizabeth has experience representing clients on tax-exempt bond financings and tax credit syndications of Low Income Housing Tax Credits for the development, operation and maintenance of affordable housing. During law school, Elizabeth was a senior editor for the Journal of International Law and Business and treasurer for the Latino Law School Association. She spent her first summer as a law school student working in the legal department of one of the world's leading producers of systems for power generation and transmission, as well as medical diagnosis. Prior to law school, Elizabeth worked for several years in regulatory and operations management for one of the largest international financial institutions. Shown below is a selection of Elizabeth’s engagements. Counsel to a developer of distinctive real estate properties with its refinancing of the construction loan used to develop a complex in Manhattan. The project, which is comprised of three separate condominium regimes, contains more than 1,200 residential units (more than 240 of which are reserved for low-income individuals and families), plus ancillary parking facilities and a large retail eatery. The Katten team coordinated the tender of more than $500 million in New York State Housing Finance Agency tax-exempt and taxable bonds and direct purchase of such bonds. Representation of a multifaceted real estate company serving the greater New York area in closing a financing transaction for the acquisition and rehabilitation of several multifamily rental properties containing 100% affordable housing located in the Bronx. The transaction included negotiating a construction loan from the New York City Housing Development Corporation, permanent financing and the issuance of a letter of credit from a multinational banking and financial services holding company. The Katten team additionally coordinated obtaining the necessary approvals and contract extensions from HUD and the properties' current limited partners, worked with the project's nonprofit purchasing entity and negotiated amended operating documents with the client's low-income housing tax credit investor partner. Representation of a developer of distinctive real estate properties in connection with the syndication of low-income housing tax credits generated by a $550 million 80-20 multifamily housing development located in New York, New York. Katten assisted with obtaining necessary approvals from state and local governmental entities. a two-year, $125 million conduit financing secured by vacation ownership loans. Representation of a federal loan agency in the acquisition of multifamily housing revenue bonds from approximately 30 separate bond deals from a mortgage holding company. Representation of the financial services unit of an American conglomerate in connection with a $115 million mortgage loan to refinance a construction loan relating to a Houston hotel in an historic building. The rehabilitation of the hotel had been financed in part by historic rehabilitation tax credits and various other tax incentive programs, making a major focus of the permanent loan negotiations obtaining a subordination agreement from the holders of the various tax credits. Representation of the financial services unit of an American conglomerate in connection with a $120 million mortgage loan assumption relating to 21 golf properties across the country. Representation of a residential and commercial real estate acquisition, development and property management firm in the closing of a $380 million bond and construction loan financing for the development of several structures in Manhattan. The development will contain more than 1,000 residential apartments, more than 200 of which will be reserved for tenants whose household incomes are at or below 60 percent of the New York City Area Median Income, more than 35,000 square feet of commercial space and parking for hundreds of vehicles. The transaction is also structured to facilitate the potential syndication of tax credits. The closing also required the negotiation and execution of a sublease of the affordable apartments to preserve various tax benefits. Representation of a leading global alternative asset manager as mezzanine lender in connection with a mezzanine loan transaction in a financing package totaling more than $225 million.